JOIN THE #InMyHeadGiveAway Contest NOW!! The iPhone6 contest will run for 3 weeks on the three major social media platforms – twitter, instagram and Facebook. At the end of the first week, the top 5 contestants – with highest likes or retweets – from each platform qualify for the next stage. Each qualifier wins branded tees. The overall winner emerges at the end of the week. This will be the person whose post on Solidstar’s page (IG, Twitter or Facebook) has the highest likes/retweets. Post a short video of you dancing to In My Head Video by Solidstar, and use the #InMyHeadGiveAway on the post. Solidstar will repost on the page and then get your friends to like the page and your post on the page. 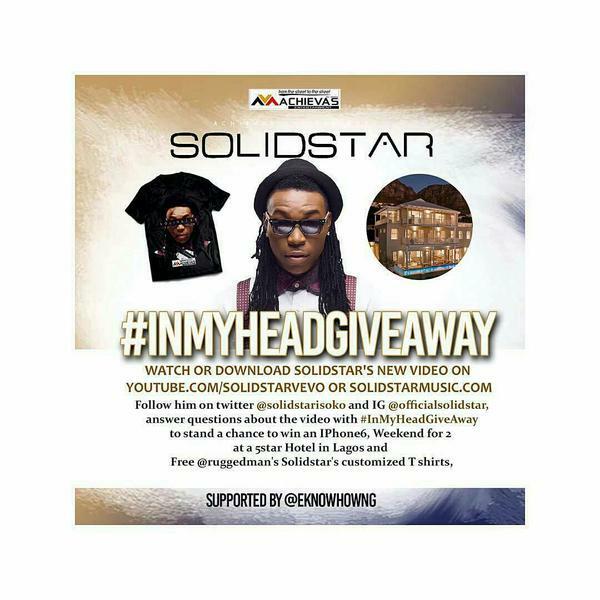 FOR INSTGRAM, Record a 15SECONDS video of u dancing to Solidstar’s In My Head and then tag both solidstar (@officialsolidstar on IG & @solidstarisoko on Twitter) and @eknowhowngusing #InMyHeadGiveAway on the post. Solidstar will repost on his page and den u can tag ppl on the post and urge them to like. 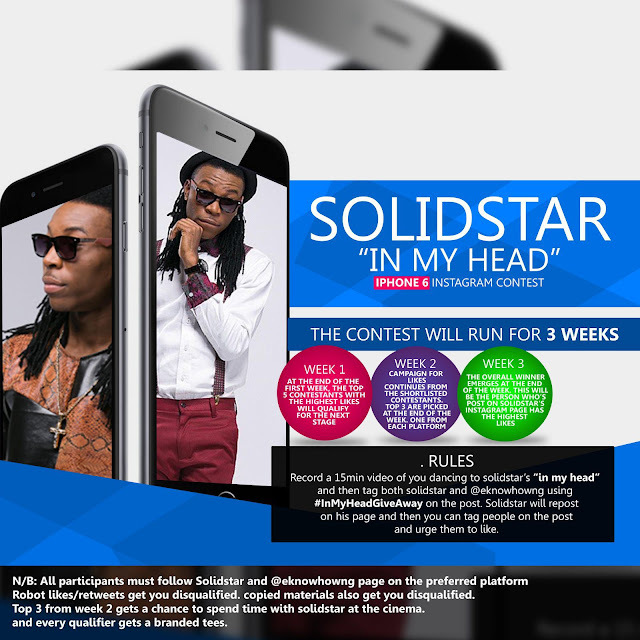 FOR TWITTER, Take a picture of your phone playing the In My Head video, or a video of you dancing to the song, cc @solidstarisoko using #InMyHeadGiveAway on the post. You must show your phone face on the picture. Solidstar will favorite only the eligible entries and then you can start inviting tweep to retweet your tweetAll participants must follow Solidstar’s page on the preferred platform (Maybe alongside@eknowhowng). Robot likes/retweets get you disqualified. Copied materials get you disqualified.